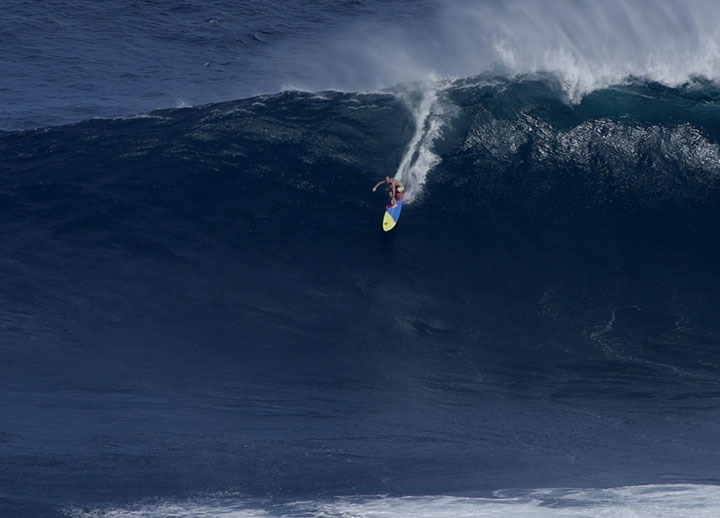 Jeff Rowley takes on Jaws. Photo courtesy of Jeff Rowley. The Valley Isle’s winter season ushers in dangerous and glorious swells at Peʻahi, a world-renown surf break on Maui’s north shore, where the top echelon of professional riders and extreme enthusiasts line up for their most epic sessions. Jaws surf break barreling. Photo courtesy of Jai Mansson. This surf mecca is nicknamed Jaws for good reason. From November to March, monstrous swells can reach up to 70 feet pushing speeds of 30 miles per hour. Its thunderous roar rattles surrounding fields of sugarcane and pineapple. The reef and rock formation underneath increases the wave’s magnitude and forms massive barrels. The unpredictable break shifts at a moment’s notice and being caught and rag-dolled in its impact zone poses frightful and hazardous risks. Simply put, immense training is required. 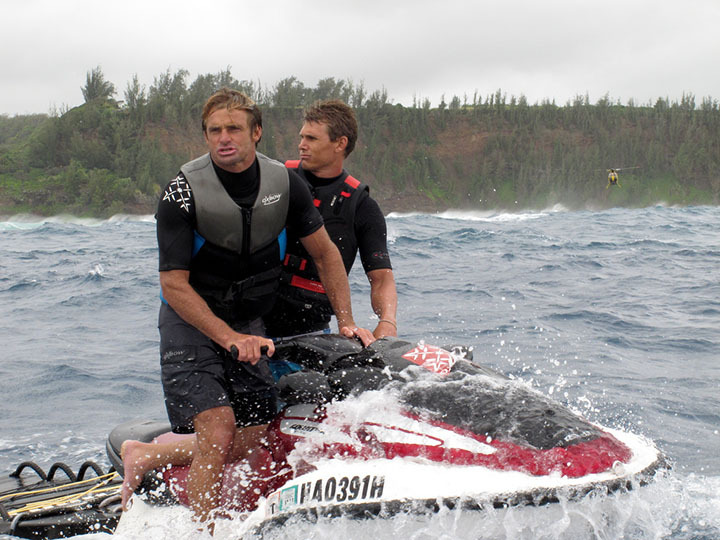 Laird Hamilton and friend Jamie with helicopter in the background. Photo courtesy of Jai Mansson. Though Peʻahi means ‘to beckon,’ its earlier reputation was anything but inviting. Legendary innovations by Laird Hamilton, Dave Kalama and a few others made the notorious waves finally attainable. Big-wave surf continues to evolve since the birth of tow-in surfing on Maui in the early nineties. 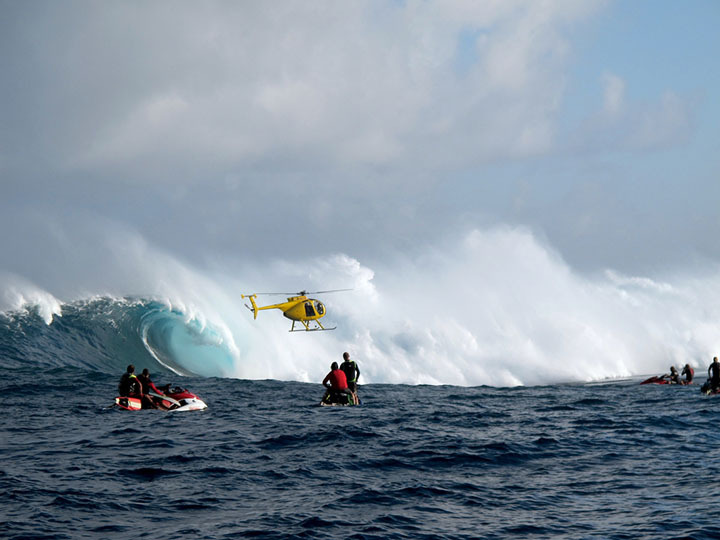 Jet skis and occasional helicopters still provide the most proficient tow when the bay is going off; while other surf devotees launch off of Peʻahi’s rocky shores or Maliko Gulch then paddle across the rolling whitewater to charge the pounding surf—a colossal feat in itself. From Hamilton to Kai Lenny, Maria Souza to Paige Alms, these watermen and women risk life and limb for the chance to push their personal boundaries and conquer Jaws’ merciless crest. Road to Jaws. Photo courtesy of James Brennan. Peʻahi can be found three miles east of Paʻia. For surf access, follow Hahana Road off Hana Highway (Highway 36) between mile marker 13 and 14. The last mile and a half is unpaved. A four-wheel drive is recommended during rain, otherwise it’s a three-mile round-trip hike on a dirt road. 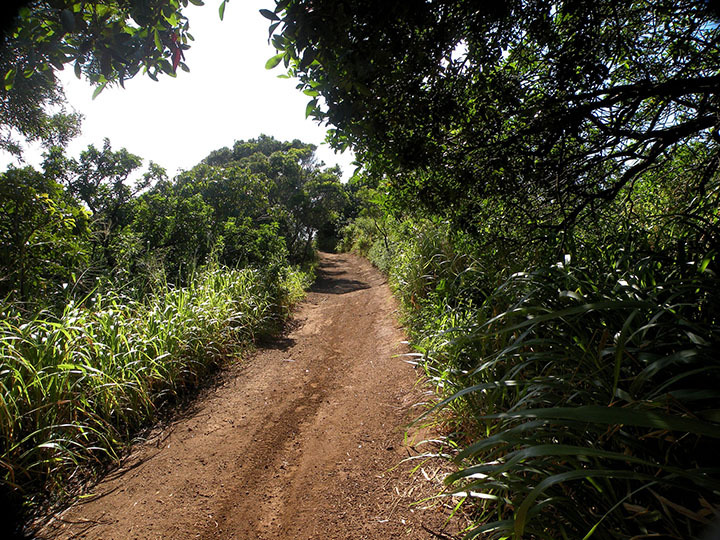 Peʻahi Road leads to a bluff where cliffside spectators witness the most victorious glides and vicious wipeouts. If you do make it on the lookout, it is best to be equipped with binoculars or long-focus lenses for the camera. Famous Manta Ray Night Dives with professional and knowledgeable staff. Meet Lefty, Bertha or Koie in a night to remember. 2 tank dive starts at $175. Kauai Sea Tours offers $10 off when you reserve your whale watching tours online! 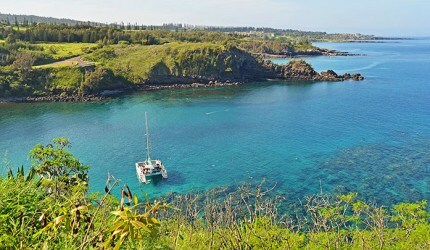 Choose from a variety of catamaran or raft adventures along the magical Napali Coast of Kauai. Online bookings also earn you 10% off at the gift shop!